Jeff Odell has pursued the “truth of color” for more than 30 years on the Central California Coast, painting rural/urban landscapes, seascapes, portraits and figures, interior studies, and “anything that will sit long enough to serve as a subject.” He has created public artwork within the City of Morro Bay, including two “Art Cans” (large concrete trash cans turned into murals); one is located at the top of the Centennial Stairway, next to Dorn’s Breakers Café, the other is at 845 Embarcadero. 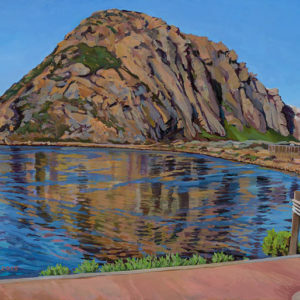 He has a large mural on the north wall of the Backstage Salon, located at 960 Main Street, and he has also worked with school children to create a large painting on canvas, which hangs in the multi-purpose room at Del Mar Elementary School in north Morro Bay. A major influence for Jeff was his experience in the painting studio of nationally recognized painter and Professor Emeritus Wilbur Niewald, who taught that the only way to get at the visual truth of color is to work directly from nature.